On the evening of Dec. 30 a rally was organized by the Russian opposition on Manezhnaya Square, just outside the Kremlin, to mark the issuing of a suspended sentence to opposition figurehead and activist Alexei Navalny in a trial based on what many consider to be false charges. RBTH editor Kira Egorova, who attended the rally, lists five things you need to take into account to be able to support any conversation about Navalny and the current state of the Russian opposition. Dec. 30 could be described as the day of the Russian opposition in 2014. In terms of the saturation of the coverage of events online and the intensity of emotions among opposition-minded Russians, the news takes second place this year only to the Winter Olympics in Sochi. It’s quite difficult to describe it all in one text, as each episode generated its own separate series of articles in the Russian media, but I have tried to combine everything to give a general overview of events as they unfolded. Originally it was planned to hold a rally in support of leading opposition politician Alexei Navalny on Jan. 15. However, the court suddenly decided to postpone the sentencing of the Navalny brothers from Jan. 15 to Dec. 30. The information about the Dec. 30 meeting on Manezhnaya Square appeared only on Dec. 29. In the next 24 hours a group on Facebook dedicated to the yesterday’s rally, gained more over 16,000 participants. On the morning of Dec. 30 the Moscow court announced the final verdict in the so-called Yves Rocher fraud case. The court gave Alexei Navalny a suspended sentence of 3.5 years, but his brother Oleg – who has no public profile to speak of – got a full sentence of 3.5 years. The court’s decision came as a surprise to many: No one was anticipating that the sentence could be softened or might even be suspended. The day before, all the country’s liberal media were talking about a jail term and comparing Navalny’s trial to the political arrest of oligarch and former Yukos head Mikhail Khodorkovsky, who was imprisoned for 10 years. Earlier it was reported that the court could convict the Navalny brothers to a period of 8 to 10 years. In the evening of Dec. 30, Alexei Navalny violated his house arrest and went to Manezhnaya Square, writing on Facebook: "House arrest - sure, but today I'd like to be with you. So I’m coming too." OMON riot police detained the politician near the square, after which he was returned home. 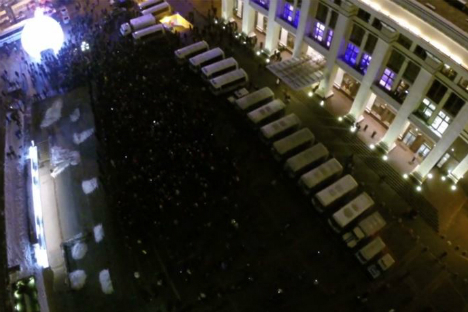 A video shot by a drone at Manezhnaya Square on Dec. 30. Source: Karlsson Project on Vimeo. In general, people at the Dec. 30 rally behaved less vigorously – there were no posters, labels, badges, stickers or protest chants. It seemed that people were just standing in groups on the square and quietly discussing something in private conversations. But the spirit was cheerful. Curiously, the protesters have started using FireChat, an instant messaging client that operates without access to the internet. The San Francisco-based company Open Garden, the developer of FireChat, reported a sharp increase in demand for the service in Russia on Dec. 29, reports Russian daily Vedomosti. The same application was used by protesters in recent demonstrations in Hong Kong and Taiwan. For the entire year, the Russian opposition has acted very passively, as if it had fallen into a lethargic sleep in the circumstances of the phenomenal growth of the president’s rating, the Olympic victories and all the Crimea-Ukraine news. By November, it seemed obvious to everyone that the "second opinion" in Russia had been completely forgotten. However, on Dec. 30 opposition held a rally by a single occasion. And this occasion, just like 1.5 years ago, was a trial of the principal figurehead of Russian opposition politics – Alexei Navalny. For sure, yesterday's rally was less spectacular: no more pasting stickers with the name Navalny on the State Duma building , no more sarcastic protest posters, and the number of participants was not really impressive in itself. But the fact that the opposition could rise from the ashes in the space of just 24 hours is breathtaking. It means that fascinating processes are still at work in Russian society – processes that arecapable of affecting the country’s authorities and the mood of the population as a whole. And this simple observation in itself is already a good opportunity for reflection.